I printed out the cards and laminated them and put them in a non see through bag. 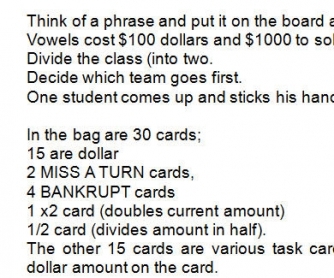 Vowels cost $100 dollars and $1000 to solve. Divide the class (into two. Decide which team goes first. One student comes up and sticks his hand in the bag you are holding. 1/2 card (divides amount in half). 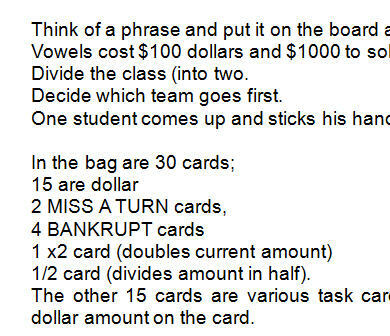 The other 15 cards are various task cards that the student (or team) must perform to receive the dollar amount on the card. The student completes the task, they get the dollar amount and their team chooses a letter. If the letter is in the phrase, they get to go again; if not, their turn is over.